Aim: This study aims to evaluate the retrieval outcome of the separated endodontic instrument by endodontic board residents. 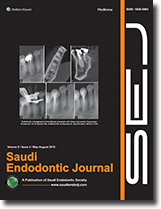 Materials and Methods: Records of 450 endodontic cases with separated endodontic instruments treated by endodontic Saudi board residents were randomly selected. The evaluation was based on the tooth type, type of fractured instrument, incidence and anatomical location in the root canal and if the instrument was retrieved, bypassed, or left. Data were statistically analyzed using IBM-SPSS.22. Results: A total of 84 (19%) separated instruments were identified. Thirty-four cases (7.55%) with separated instruments out of the total evaluated cases were done by residents. The incidence between hand stainless steel and nickel-titanium instruments was statistically significant (P < 0.05). The separated instruments were found more in the mandibular molars, i.e., 44 (52.4%). They were observed more in the buccal canal of the maxillary premolars and mesiobuccal canals of mandibular and maxillary molars. Fifty-seven (67.9%) of the separated fragments were located in the apical third of the root. Thirty-six (34.3%) were retrieved, 20 (19.0%) were bypassed, and 34 (32.4%) were left while 15 (14.3%) were managed by surgery. The ultrasonic device was more active in removing the separated instruments. Conclusions: Regardless of little experience of the endodontic residents, they were successfully managed to remove or bypass most of the separated instruments. Ultrasonic device was very helpful in removing the separated instrument. Aim: This study aims to compare the cyclic fatigue resistance of new and used ProTaper Universal (PTU) and ProTaper Next (PTN) rotary nickel-titanium systems using artificial canals. Materials and Methods: Twenty sets of PTU and PTN were included in the present study. The groups were set as follows: Group A: 10 new sets of PTN instruments; Group B: 10 clinically used sets of PTN instruments; Group C: 10 new sets of PTU instruments; and Group D: 10 clinically used sets of PTU instruments. The cyclic fatigue tests were performed using a specially manufactured dynamic cyclic fatigue-testing device, which has an artificial stainless steel canal with 60° angle of curvature and a 2 mm radius of curvature. New and used files were rotated until fracture, and the cyclic fatigue device stopped automatically by the fracture and showed the fracture time on the screen. The number of cycles to fracture for each group was calculated and compared using paired and unpaired t-tests using SPSS 21.0 software. Statistical significance was set at 5%. Results: For both rotary systems, the new instruments showed statistically higher cyclic fatigue resistance than the used instruments (P < 0.05). The mean number of cycles to fracture of PTN instruments was significantly higher than equivalent file sizes of PTU instruments (P < 0.05). Conclusions: Within the limitation of the present study, reduction in the cyclic fatigue resistance for PTN and PTU instruments was observed after clinical use when compared to new groups. Introduction: Nonsurgical retreatment of failure cases requires regaining access to the entire root canal system through complete removal of the core filling material and sealer. 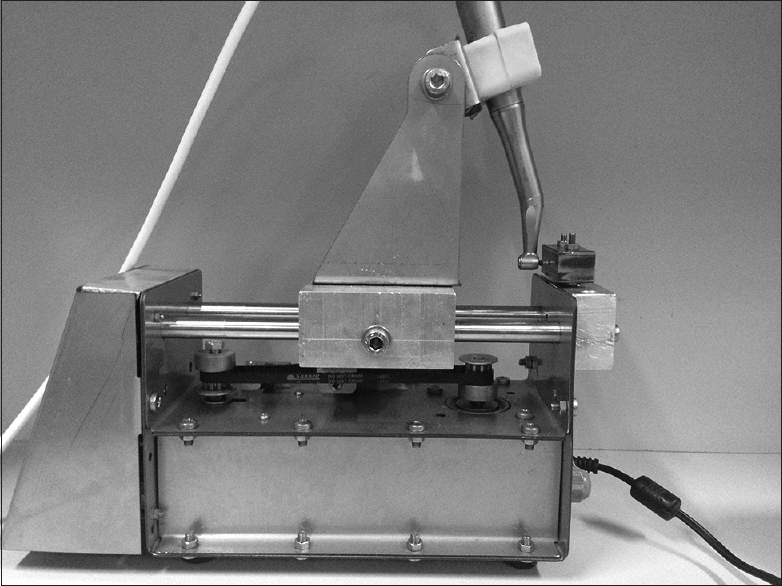 Aims: The aim of this study was to compare the retrievability of gutta-percha (GP), Resilon, and CPoints, using Protaper and Mtwo rotary retreatment systems. Materials and Methods: Sixty freshly extracted mandibular premolars were decoronated and biomechanically prepared and obturated using GP, Resilon, and CPoints along with their corresponding sealers, in twenty teeth each. The teeth were divided into 6 groups of 10 teeth each. 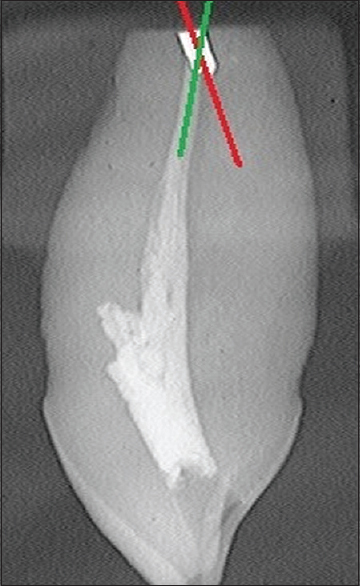 The filling was removed after 2 weeks with Protaper and Mtwo rotary retreatment files and the teeth were analyzed using cone beam computed tomography, to assess the remaining percentage volume of obturation material from each group. The data were statistically analyzed by ANOVA (post hoc test) followed Dunnett's t-test to evaluate statistical significant between the groups and paired t-test to find statistical significant before and after treatment. Results: The analysis of the results showed that the mean volume percentage of the residual material is low for Resilon group with Protaper retreatment file (16.35 ± 2.69%) and high in the groups obturated by CPoint and removed by Mtwo retreatment file system (29.67 ± 2.34%). Conclusions: Canals obturated with CPoints and endosequence bioceramic sealer are the least retreatable among the study groups. 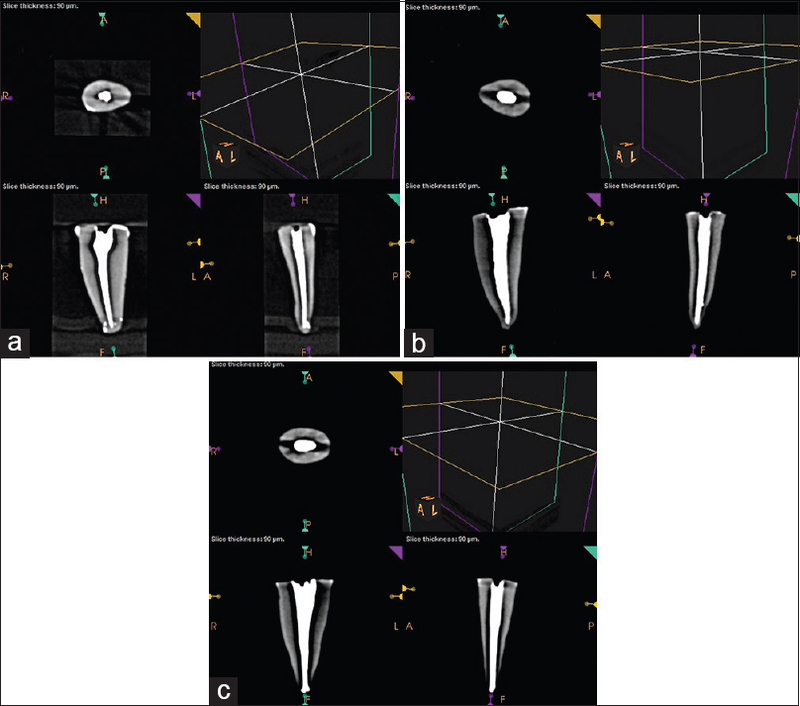 Objective: To determine the prevalence of pulp stones using cone-beam computed tomography (CBCT) and to explore any potential correlation between the occurrence of pulp stones with age, gender, tooth, arch, and tooth status. Material and Methods: CBCT scans of 428 patients comprising of 2982 teeth were retrospectively evaluated in the present study. All teeth were analyzed in sagittal, axial, and coronal plains by two examiners. The pulp stones were identified as the presence of a definite round or oval opaque or dense mass in the pulp cavity. The location of the involved tooth in terms of jaw and side and the status of involved tooth in terms of caries, restored, attrition, and periodontal disease were recorded. Statistical analysis was carried out by applying Chi-square tests with the Yates correction. Results: Out of a total of 428 individuals, pulp stones were identified in 50.93% of patients and 13.34% of teeth. The presence of pulp stones was more frequently encountered in males (58.89%) than in females (41.14%) and in individuals belonging to the fifth decade. First molars exhibited the highest incidence of pulp stones (P = 0.0090). No significant difference was observed when maxillary and mandibular arches and the sides were compared. The presence of pulp stones was high in carious, restored, attrited teeth and teeth with periodontal disease, when compared to the intact teeth (P < 0.05). 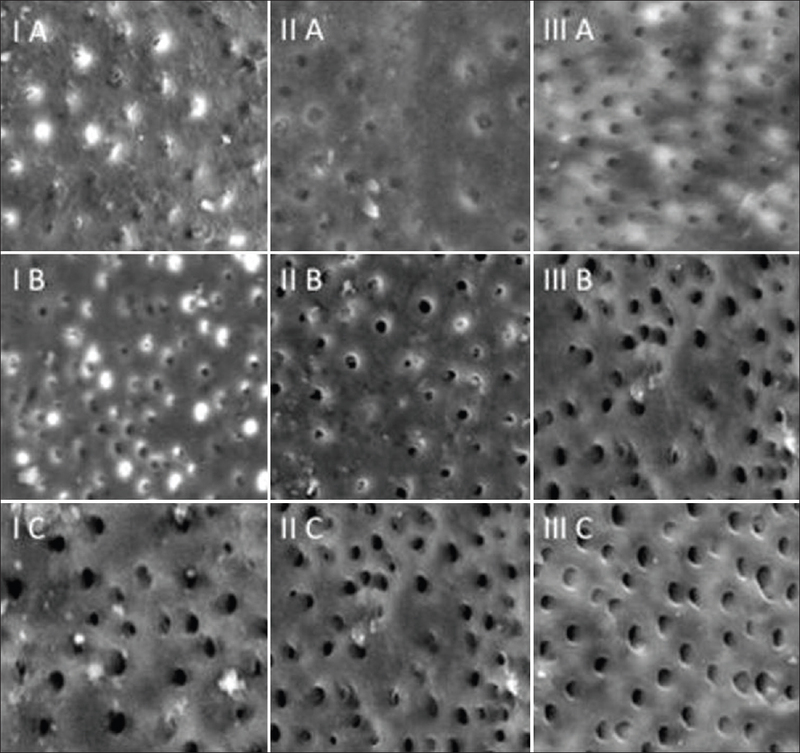 Conclusion: Pulp stones were observed more frequently in molars and in nonintact teeth. Pulp stones occurred predominantly in males in the fifth decade irrespective of arch and side. Introduction: The aims of the present study were (1) to compare the in vivo accuracy of electronic apex locator (EAL) to locate the apical foramen and apical constriction (AC) in vital and nonvital teeth and (2) to measure and compare the distance between the AC and apical foramen based on EAL readings and those obtained by direct observation under stereomicroscope following extraction of the tooth. Materials and Methods: A sample of 40 teeth scheduled for extraction independent of the study from patients in the age range of 45–65 years was selected and divided into two groups (Group I – vital and Group II – nonvital). The AC and apical foramen were located using Root ZX II (J. Morita Corp, Kyoto, Japan) in both the groups and then by direct observation under stereomicroscope following extraction. Results: Fischer's exact test found no statistically significant difference in the ability of EAL to locate AC and apical foramen when compared between vital and nonvital teeth. Likewise, no statistically significant difference was found in the distance between the AC and apical foramen as measured by EAL in vivo and that measured by direct observation under stereomicroscope following extraction in vital (P = 0.412) and nonvital (P = 0.719) teeth (paired t-test). Conclusion: The study supports that EAL measures the location of AC and apical foramen with similar accuracy in vital and nonvital teeth. Furthermore, the distance between the two is reliable when compared with the actual distance observed under stereomicroscope supporting its widespread usage in clinical endodontics. 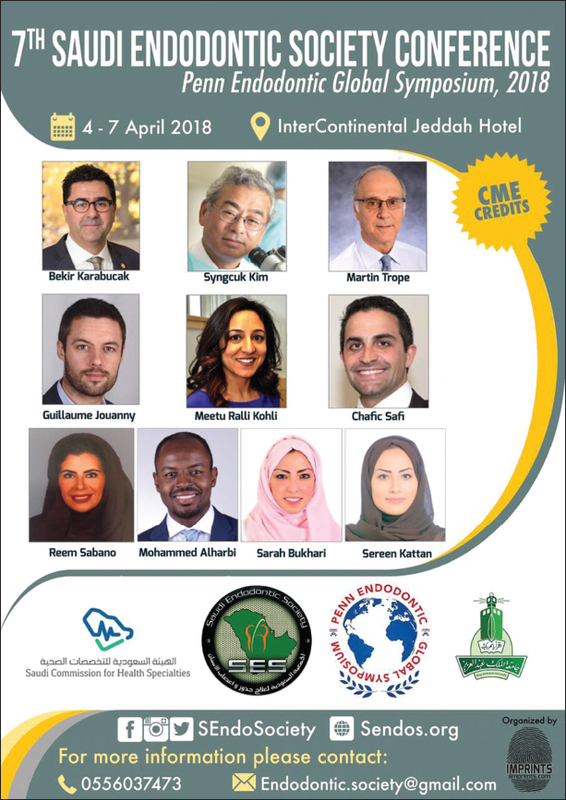 Objective: To assess the level of knowledge and practice of sterilization of endodontic instruments among future dental surgery assistants undergoing training. Methodology: Data were collected by means of a self-administered questionnaire consisting of demographics, the knowledge of the respondents with regard to sterilization techniques for endodontic files/reamers and handpieces, the attitude of the respondents to transmission of infection from unsterilized endodontic instruments, the sterilization techniques practiced by the respondents for endodontic instruments and materials, and the source of training/knowledge regarding endodontic sterilization. The data were subjected to statistical analysis in the form of descriptive statistics, frequencies, mean and standard deviation. Results: Steam autoclave and dry heat sterilizer were the most reported options for sterilization of endodontic files and reamers. 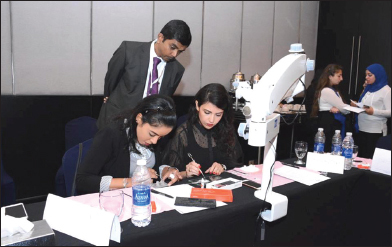 About 95.6% of the respondents claim that they often sterilize endodontic instruments in the course of their training. About 83.3% never sterilize gutta-percha while 50.0% claim they always sterilize new files and reamers before initial use. About 82.2% thought infection could always be transmitted from patient to patient if unsterilized files are used for endodontic treatment. Conclusion: The dental assistants in this study appear to have a fair knowledge of endodontic instrument sterilization; however, they need to expand their scope of practice beyond what is available for use. Aim: The aim of this study is to evaluate the smear layer removal efficiency of Max-I-Probe, EndoActivator, and EndoVac at three different levels in the apical portion of curved root canals. Materials and Methods: Mandibular molars with angles of root curvature between 25 and 40 degrees were selected and divided into three groups. The specimens were instrumented to size 35/0.04. Group 1 received conventional irrigation with Max-I-Probe needle; Group 2 and Group 3 were irrigated with EndoActivator and EndoVac, respectively. Following shaping and cleaning, the roots were observed under scanning electron microscope for smear layer at three levels (1 mm, 3 mm, and 5 mm from working length). One-way analysis of variance was calculated and to find the exact significance among the groups a post hoc test, i.e., Bonferroni test was performed. Results: The level of significance was set as P < 0.05. The EndoVac system resulted in a significantly better smear layer removal than the Max-I-Probe needle at all levels. The EndoVac also demonstrated enhanced smear layer removal than the EndoActivator at 3 mm and 1 mm levels. Conclusions: The application of EndoVac system could enhance smear layer removal at the apical portion of curved canals. Aim: The aim of the study was to evaluate the effect of different irrigation solutions on cyclic fatigue of ProTaper Next (PTN) rotary files. Materials and Methods: A total of 50 files were divided into 5 groups according to the environment in which cyclic fatigue test was carried out as follows: chlorhexidine (CHX) 2%, ethylenediaminetetraacetic acid 17%, saline, sodium hypochlorite 6%, and air (control group). A specially designed testing device was assembled utilizing an artificial canal made of a heat-resistant glass tube. The tube had a 1.2 mm diameter, an angle of curvature of 60°, and a radius of curvature 6 mm. Before each fatigue test, the tube was filled with fresh irrigation solution except air group, which was left dry. The mean number of cycles to failure was counted then fractography and length of broken segment were analyzed after failure. Statistical analyses were performed using one-way ANOVA test. Results: The CHX group was the most resistant to cyclic fatigue compared to all groups (P < 0.05). No significant difference was found between all other solutions or dry group (P > 0.05). Fractographic analysis of all groups showed signs of a fatigue failure. A crack site was seen followed by a striation area leading to a dimples overload area. The length of broken segments was not significantly different among all groups (P = 0.37). Conclusion: Although liquid media may function as lubrication, all irrigants except CHX failed to increase the fatigue life of PTN files when compared to dry conditions. Aim: This study aims to compare the alignment of root-end cavities prepared with ultrasonic tips with the root canal outline in teeth with and without root canal fillings using an in situ cadaver model. Materials and Methods: Twenty-eight bilaterally matched pairs of human teeth from five cadavers were equally divided into two groups: teeth with root canal fillings (RCF) and teeth without root canal fillings (NRCF). The resected root surface was stained with methylene blue and examined under magnifying loops; then, the root-end cavities were prepared in both groups using ultrasonic tips and filled with amalgam. The teeth were carefully extracted, mounted in resin blocks, radiographed from two angles, and then sectioned at 3 mm from the root end. 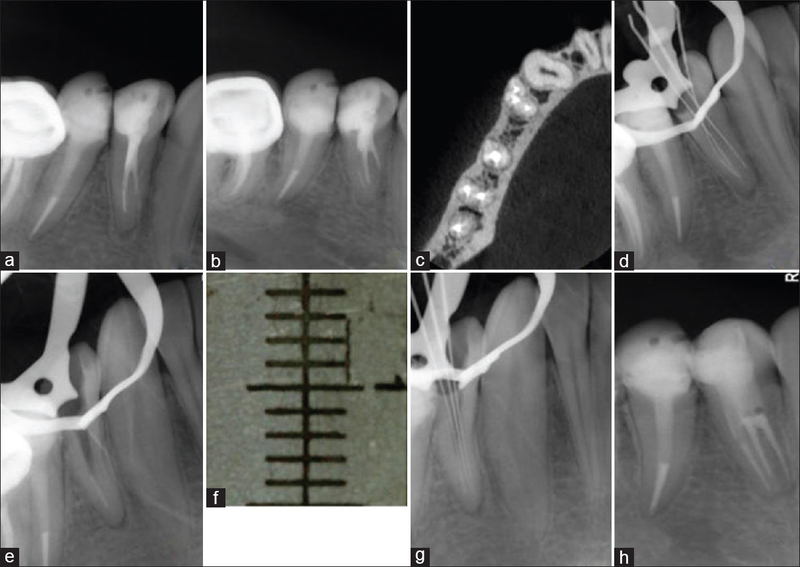 The alignment of root-end cavities in both groups was compared using defined criteria. Results: The RCF group had a significantly higher incidence of centered root-end preparations than NRCF group on the buccolingual (79% vs. 64%) and mesiodistal (64% vs. 24%) directions. However, both groups showed high incidence of deviated cavities at the horizontal cross-section and the difference between them was not significant. Conclusions: The presence of root canal filling improved the alignment of root-end cavities prepared with ultrasonic tips. Aim: The purpose of this in vitro study was to evaluate and compare the effect of 7% maleic acid and QMix root canal irrigants on the push-out bond strength of GuttaFlow 2 to root canal dentin. 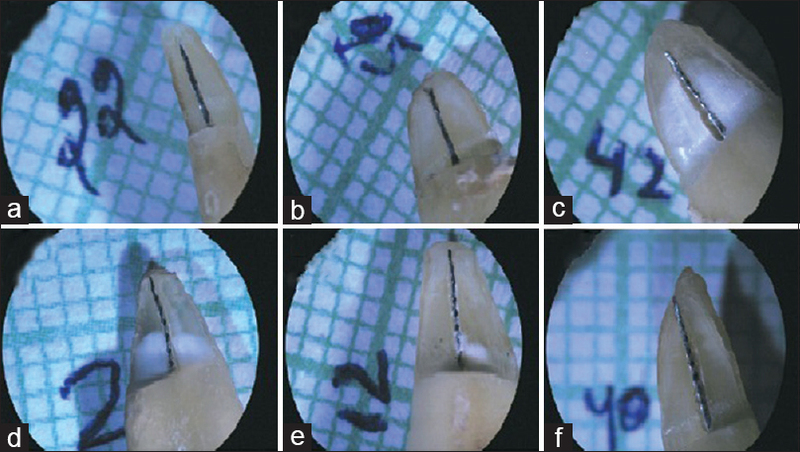 Materials and Methods: Thirty single-rooted maxillary incisors were taken and decoronated to a standardized root length of 15 mm. Canal patency was established and working length was determined using #15 K file. The root canals were then prepared to F3 size using nickel-titanium ProTaper rotary instruments with 3 ml of 2.5% sodium hypochlorite irrigation performed between each instrumentation. Then, based on the final irrigation regimen, the specimens were randomly divided into three groups (n = 10): Group 1: QMix, Group 2: 7% Maleic acid, and Group 3: 0.9% Saline (control group). The root canals were obturated using GuttaFlow 2 sealer and 2-mm horizontal thick sections of each root were prepared at three levels using a hard tissue microtome. 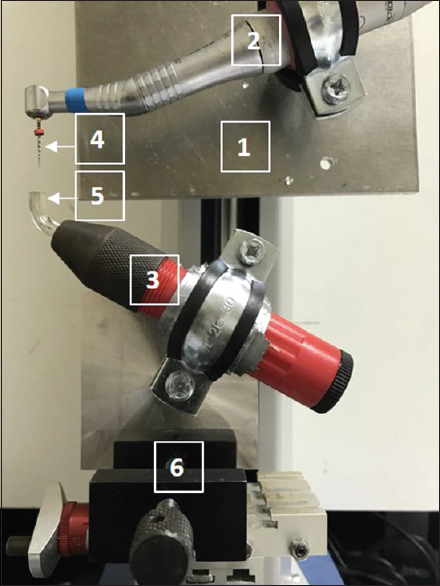 Push-out bond strength was measured using a universal testing machine by application of compressive force to each root canal filling at a crosshead speed of 1 mm/min. Results: Group 3 showed significantly higher bond strength values than Group 1 and 2 in all the three levels of the root canal. Conclusion: The smear layer removal using 7% maleic acid and QMix as a final rinse did not enhance the bond strength of GuttaFlow 2 to radicular dentin. The proper knowledge of both the external and internal anatomy of teeth is mandatory for adequate root canal treatment. Permanent mandibular premolars are usually single rooted with single root canal. Variations of having more than one canal/root also exist. This paper describes a case series of root canal therapy of permanent mandibular premolars with three root canals. The clinicians must be aware of such anatomical variations and be able to use variety of tools for adequate diagnosis and management. The possible variations of anatomical and morphological characteristics of the teeth are very important especially for the endodontic practitioners for successful treatment. Mandibular molars are most commonly affected by dental caries and require endodontic treatment. Mandibular molars exhibit variations in its internal anatomy; one among those is the presence of an extra canal in the mesial root called as middle mesial (MM) canal. Detection of these minute canals requires a proper clinical knowledge and radiographic examination. This article presents the treatment of three cases of mandibular first molars with MM canals without the aid of any magnification devices. Dens invaginatus (DI) is an unusual anomaly of teeth, presumably resulting from an infolding of the dental papilla during tooth development. The root canal treatment of such teeth is arduous because of problems associated with gaining access to the root canals and with variations of canal morphology associated with this type of malformation. 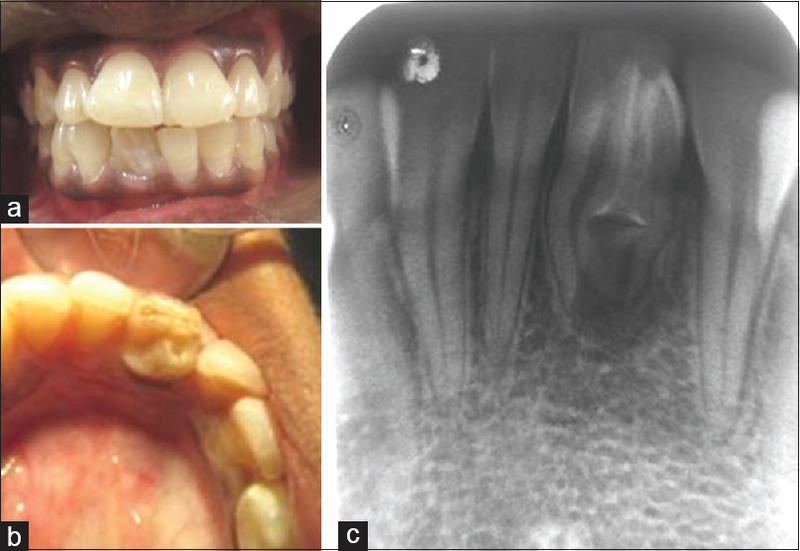 The present case describes the effective endodontic treatment of an Oehlers Type IIIB DI in a mandibular right central incisor associated with periapical lesion. It likewise demonstrates that spiral computed tomography scan is a significant auxiliary aid to avoid errors in diagnosis and treatment of the dental anomaly.